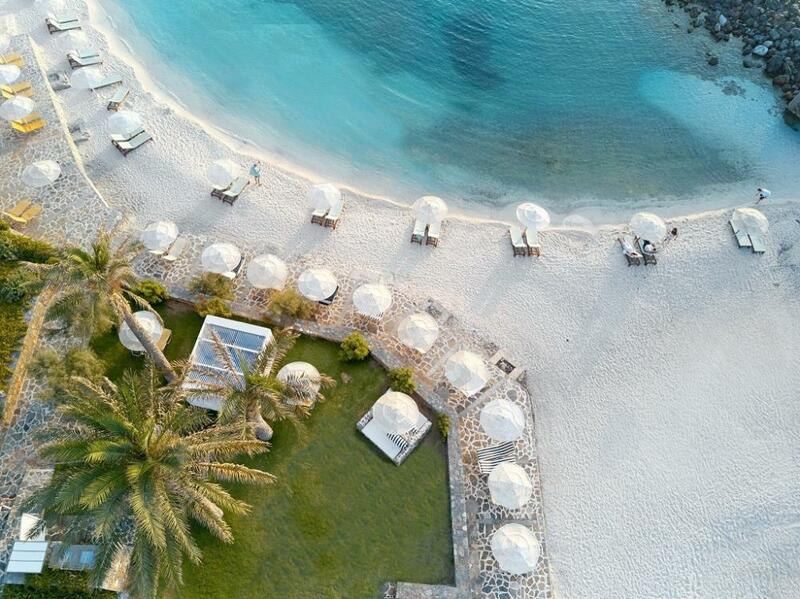 Set on the edge of the Aegean Sea, Radisson Blu Beach Resort in Milatos is surrounded by turquoise waters and idyllic beaches. 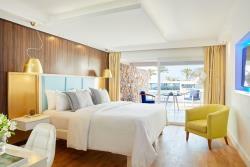 This 5-star hotel in Crete offers multiple accommodation options and premium services in a stylish seafront environment. 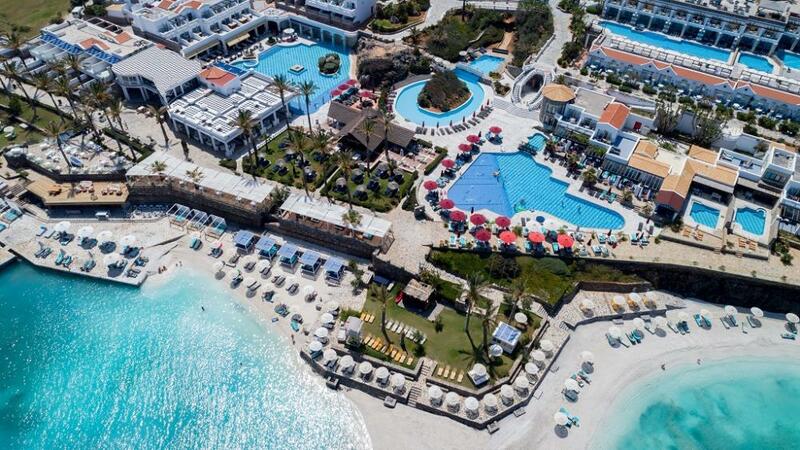 Located just 40km east from Heraklion Airport, at the Emerald Bay of Milatos, Radisson Blu Beach Resort Crete is here to welcome you as a oasis destination rather than just a resort. Infinity sea views, two private beaches, lush zen gardens, waterfalls, 5 swimming pools and extensive landscaped grounds (190,000 m²), together with the multiple on-site dining venues enable you to make the most of your holiday. Choose from among 318 spacious rooms and suites and take in dramatic views of the dazzling waterfront. The sparkling new guestrooms, the ''White Sensation Suites'' by Radisson Blu Beach Resort Crete set new standards in stylish resort chic. Sample a variety of delectable cuisine ranging from regional fare at 'Ariadni' to sumptuous International Flavors at '1948 Bellevue'. The family-friendly accommodation also boasts 4 swimming pools, including a water park and an adults-only pool. The younger guests can hang out at the kids' club while parents head to the tennis courts or to simply relax at the beach. Meanwhile the Boutique Spa beckons visitors to indulge in a pampering treatment or to refresh in the hammam. After a full day of rejuvenating mind and body, unwind on your private balcony to relish the soothing sea breeze. Take advantage of their meeting room to host special social events or business gatherings. The resort’s conference hall is equipped with modern audiovisual media, free high-speed wireless Internet, a microphone and a projector for supporting your presentations or special event. The meeting room offers a convenient venue for private events and meetings. The indoor venue, Blu Hall, covers 280 square meters. The luxurious rooms and suites of Radisson Blu Beach Resort are inspired by the Greek islands and are part of two different design groups. The first group of rooms and suites is inspired by the ancient civilization of Crete, uses Minoan color schemes in its stylish interiors and offers spacious bathroom amenities and large verandas, while the balconies of the rooms offer magnificent garden and sea views. The second group is inspired by the island of Mykonos and the Cyclades in general. The White Sensation Collection features modern design, luxurious furnishings and comfortable interiors. Each room has full-length windows, modern beds with 3 levels of mattresses and various kinds of pillows, so that the guests can experience the maximum possible comfort. Pure luxury is combined harmoniously with magnificent garden and sea views, giving each visitor a wonderful hospitality experience. The Standard Room enfolds twin beds or a King-size double bed, an extra sofa bed and functional furnishing. The elegant bathroom is fully equipped with branded amenities and features a separate shower cabin and a bathtub. Relax on your furnished balcony or terrace, enjoying the view of the resort's rich gardens and indulge yourself in a natural rejuvenation. Enjoy a unique holiday experience, going from your room to your pool in seconds. Steps from the beach, the Superior Room Swim Up Pool exudes style and serenity in the lavish island retreat. Enjoy the convenience of a private cabana while staying in these sea view rooms with twin beds or a King-size double bed with king-size pillows and a pillow bar, elegant furnishing and a luxurious bathroom with a bathtub, a separate spacious rainfall shower cabin, Italian marble vanity and branded amenities. This exclusive and innovative room offers direct access to a same level shared pool including private sun beds, outdoor dining table, daybeds and an outdoor couch. Enjoy your holiday on your private cabana overlooking the amazing blue of the Aegean Sea or share precious moments together in the spacious indoor and outdoor living area. Designed to provide the utmost comfort, this room type provides upscale amenities, while gazing at the vast Cretan sky and the blue of the Aegean Sea. the maisonette style Superior Loft with Private Pool features a spacious terrace with amazing sea views, a private pool, lofty design, a King-size double bed with King-size pillows, luxurious furnishing, an elegant bathroom with branded amenities, a comfortable living room, a separate twin beds bedroom and a separate bathroom with a rainfall shower. 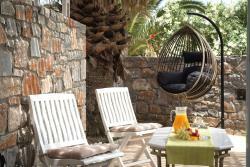 Enjoy your summer holidays in one of the best sea view maisonettes of Crete. Family is the most important social unit for us. Happy families are a source of inspiration, so we are proud to have one of the best family resorts in Greece. the Superior Family Room provides 2 bedrooms featuring a King-size bed with king-size pillows and twin beds, TVs in all bedrooms and direct access to 2 private bathrooms. The Superior Family Room also includes elegant furnishing, a comfortable lounge and branded amenities. Enjoy with your family a comfortable holiday, in a room designed to provide comfort and luxury. 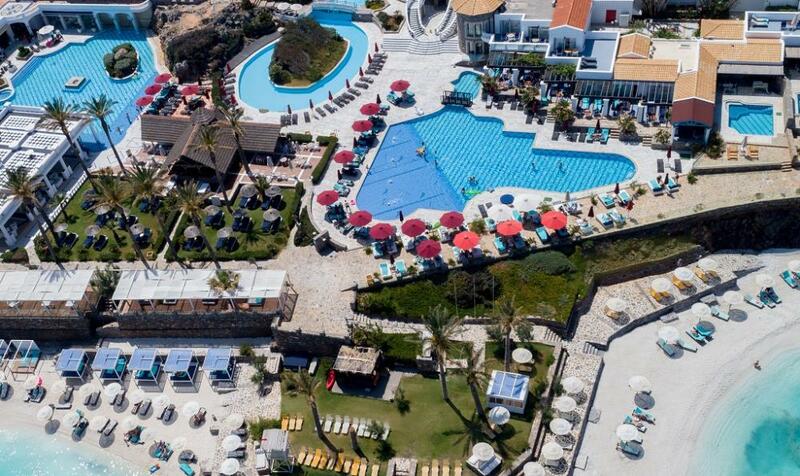 We proudly provide one of the best accommodations for families in Crete and we look forward to sharing magic moments with all your family members. Make your family's dream holiday a reality, through a prestigious stay at the Deluxe Family Suite. 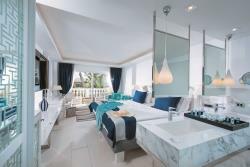 Set just steps from the beach, the Deluxe Family Suite exudes style and serenity in the lavish island retreat. 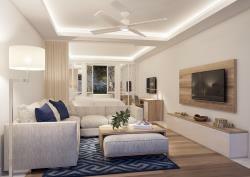 the spacious suites features two elegant bedrooms, two stylish bathrooms with bathtub and a separate spacious rainfall shower cabin, a luxurious living room, unique furnishing, a kitchenette, as well as modern in-room entertainment. Enjoy a refreshing cocktail on the furnished balcony or terrace of your room, while your children have fun around the resort. Combine your children's enjoyment with your relaxation and experience a luxurious stay in one of the best hotels for families in Greece. Inspired by Mykonian whitewashing and interior design, the Deluxe Pure White Room provides a relaxing and unique holiday experience. Set just steps from the beach and renovated in 2016, the Deluxe Pure White Room exudes style and serenity in the lavish island retreat. It features twin beds or a King-size double bed with king-size pillows and a pillow bar, an extra sofa bed, elegant furnishing and a luxurious design driven bathroom area with double vanities and branded amenities. Indulge in the pure white while relaxing in your luxurious room to give a cosmopolitan tone to your holiday. Imagine yourself in Greece, in a sea-front villa with private pool, overlooking the endless blue of the Aegean while enjoying a tea with your partner, friends or family on your furnished terrace. The Executive Pool Villa is able to turn your imagination into reality. It features two stylish bedrooms, two elegant bathrooms, prestigious amenities and a classic design. The master bedroom is within villa’s living room and features a very comfortable King-size double bed, elegant furnishing, a 55” TV, a bathroom with a bathtub and a separate rainfall shower cabin. The second bedroom also features elegant amenities, comfortable twin beds, a 42” TV and a stylish bathroom with a rainfall shower cabin. Relax in your elegant lounge while listening to the waves of the sea or watching your favorite TV series. Enjoy the unique sunset from your private pool along with the people you love. Find multiple ways to relax and enjoy your holidays in one of the best villas in Crete, which is also located on one of the best and most imposing Cretan beaches. We also recommend this villa to couples who are planning a wedding in Greece, or looking for the best honeymoon or anniversary destination. Renovated in 2017, the Superior Room exudes style and serenity in the lavish island retreat. This room has been designed for both healthy living and healthy sleeping. It features twin beds or a King-size double bed with king-size pillows and a pillow bar, an extra sofa bed, elegant furnishing and a luxurious bathroom with a bathtub, a separate spacious shower cabin, a full length mirror and branded amenities. Relax on your furnished balcony or terrace, combining partial sea views with stunning resort views, while enjoying the famous Cretan hospitality. Featuring a distinctive Mykonian color scheme and a unique Mykonian-style bathroom, the 2016 renovated Deluxe Island Suite Outdoor Whirlpool includes an American outdoor Jacuzzi, a spacious veranda with infinity resort and sea views, a King-size double bed or twin beds with king-size pillows, a comfortable living room with an 85” TV and luxurious furnishing. Branded amenities and much more features, combine a unique holiday experience. Enjoy magnificent sea views from your balcony while relaxing in your American outdoor Jacuzzi or have fun with your loved ones watching your favorite programs on your living room’s grand TV. Whatever you choose, we are sure you will enjoy a uniquely luxurious holiday experience. This suite is highly recommended to honeymooners or couples celebrating a special occasion. 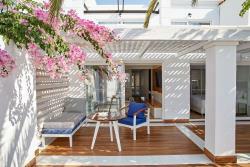 Cozy and spacious, with stunning sea views of the Aegean Sea, the Deluxe Island Suites reflect luxury and individuality. Uniquely designed, the 2016 renovated Deluxe Island Suites exude style and serenity in lavish island retreat. These suites feature special Radisson custom made bedding for healthy living and healthy sleeping and combine harmoniously elegance with spaciousness. They include a King-size double bed with king-size pillows or twin beds, extra sofa beds, luxurious furnishing, a comfortable living room with a large TV and many more upscale amenities. Suite’s luxurious bathroom is inspired by the unique Mykonian architecture and includes a free standing bathtub, a separate king-size shower cabin with a rainfall shower, double vanities and a TV. Relax in your bathtub while watching one of the 105 premium satellite channels, or feel comfortable in your luxurious living room enjoying precious moments with a refreshing drink. Surrounded by scents, views, trees, colors and vibrant water elements, the Deluxe Island Pool Villa promises a unique holiday experience starting from the moment you first enter in it. Set just steps from the beach and renovated in 2018, the Deluxe Island Pool Villa exudes style and serenity and provides an innovative level of Cretan hospitality in the lavish island retreat. Inspired by the beauty of the Greek islands, it features a private pool, luxurious furnishing, a spacious living room, King-size bed with kind size pillows and extra sofa beds, as well as a stylish bathroom with bathtub, double vanities, a spacious separate rainfall shower cabin and branded amenities. These villas also feature three TVs: one in the bedroom, one in the living room and one in the bathroom. 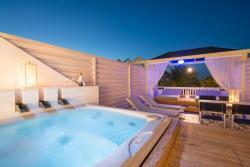 Relax in your private pool with your beloved ones, or on your modern puffs in a romantic tone. Indulge in a luxurious sensation environment and feel the sea view Villa as your dream home. Close your eyes and think of a grand and luxurious villa, overlooking the sea, able to fit and satisfy all your family or friends. What you dreamed of, we have already made it a reality for you, as the Royal Pool Villa was designed featuring the real needs of the clients who love spacious accommodation. With 160 m2 of indoor space and 115 m2 of outdoor space, the Royal Pool Villa can accommodate up to 6 adults, featuring two luxurious master bedrooms with a King-size double bed, an extra twin bed bedroom, two elegant bathrooms with branded amenities, a very stylish living room with a really large 85-inch TV, two more 42-inch TVs in the bedrooms, a PlayStation 4 console, a DVD player and plenty of other unique services. Relax in your large private pool and enjoy stunning sea views every second of your stay in one of the best villas in Crete. You deserve it and we will be sure to offer you an unforgettable holiday experience. Indulge in a culinary journey of senses and tasting. Enjoy an international breakfast, lunch or dinner buffet with a vast variety of flavors at "Mosaic" All Day Dining restaurant, or spend a day by the pool, tasting a special Mediterranean buffet, which is served at “Pool Front Restaurant” from morning until noon. Book a special breakfast or dinner at the “Ariadni” Theme Restaurant and seize the opportunity to taste "Cretan flavors and aromas". Discover the Deli restaurants: "Olivia", offering casual buffet, barbecue and salads and ‘Payot’, offering Southern American street food, burgers, fajitas and other specialties during lunch time. For the lovers of Italian cuisine, an Italian theme restaurant operates every evening, while meat lovers are worth seeing the "Payot Bucher Bar", a specialized theme restaurant in meat’s secrets. 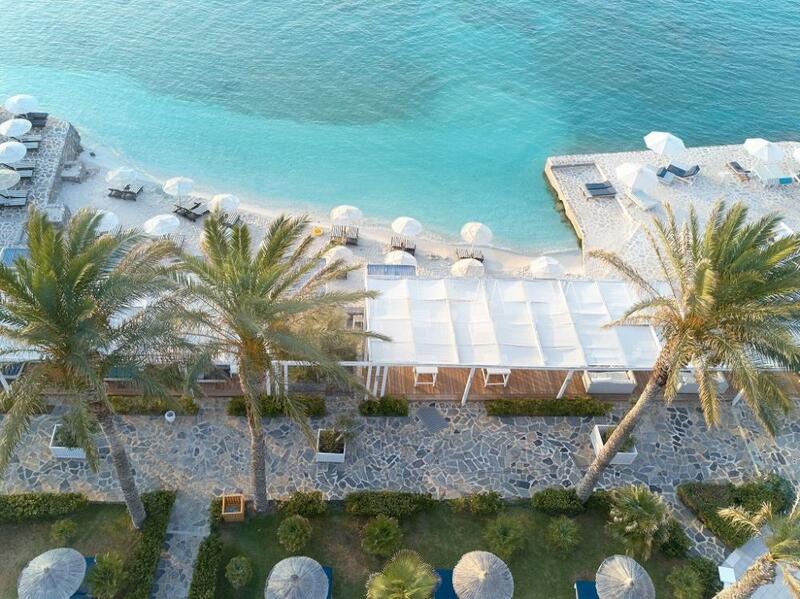 Those wishing to dine by the sea can choose their award-winning restaurant Bellevue, which offers high culinary creations, or the sea-front "On the Rocks Grill", which offers BBQ flavors, salads and Greek appetizers. All their recipes have been edited by the award-winning chef with 2 Michelin stars, Mr. Yves Mattagne. The famous Belgian Chef, guides their food departments and has exclusively compiled the menu of their "Bellevue" restaurant. Combine a wine from their unique collection with every dish in their restaurants and enjoy a different culinary experience every day. Don't miss the chance to enjoy their unique fresh fish, lobster and seafood platters. Place your orders every day at their Guest Services desk, outside the "Mosaic" All Day Dining. Guests can enjoy an Early Continental Breakfast from 07:00 to 07:30 and a Late Continental Breakfast from 10:30 to 11:00. In-room breakfast is also available with a supplement. “Mosaic” All Day Dining offers a wide variety of options, including daily theme corners, Chinese, Indian, Thai, Japanese, Italian, Grill & Rotisserie show cooking stations, Greek, International and Mediterranean flavors, freshly cut salads, sushi, homemade desserts and fruits . Guests may choose a vegetarian, meat or fish main course and try delicious dishes every day. Discover the secrets of South American street food and roasted meat at “Payot” Deli & Butcher Shop. In a tropical setting, enjoy authentic street food overlooking the sea or the pools, as well as crepes, waffles, ice cream and other sweet creations. In the evening, enjoy authentic fresh-grilled meat as it turns into a theme restaurant, offering a special culinary experience to roasted meat lovers. 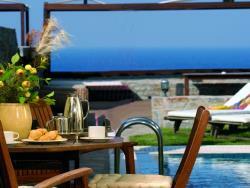 “Ariadni” a la carte restaurant serves authentic Cretan cuisine. Enjoy traditional recipes and local products in a beautiful restaurant full of scents and Greek colors. "Bellevue" a la carte restaurant prides itself on its diversity. With the signature of the famous two-star Michelin chef, Mr. Yves Mattagne, the "Bellevue" restaurant offers upscale culinary creations in a luxurious setting. Enjoy a real gastronomic experience with your beloved ones while overlooking the blue of the Aegean Sea, in an environment of high aesthetics that perfectly enhances the concept of fine dining. Located near the main pool and open from early June to mid-October, ou pool front restaurant offers Italian and other Mediterranean flavors. Enjoy a selected buffet for breakfast, Mediterranean buffet and show cooking during lunchtime and Italian flavors for dinner. Enjoy a sea-front barbecue buffet with fresh-grilled meat options. You can also enjoy fresh fish, lobsters and seafood with a supplement. Complement your meal with Greek appetizers, freshly cut salads and a vast variety of desserts and fruits, in a sea front restaurant full of palm trees and Greek colors. Olivia Deli Restaurant offers casual buffet, many barbeque options, fresh salads and delicious ice cream by the pool. Enjoy your favorite recipes, in a relaxing setting for both adults and children. Get the most out of your experience at the Radisson Blu Beach Resort with on-site entertainment and recreation. From daytime sports and activities to nighttime dancing and concerts, you’ll always enjoy a different experience at the resort. Take advantage of their private beach access or float along in one of their 5 swimming pools. Broaden your horizons with classes for tennis, dancing, and cooking. Visit their shops for souvenirs and fine Cretan goods or relax in the Boutique Spa, enjoying a massage or a beauty treatment. The resort also offers a variety of games and activities to keep the junior guests engaged.